As a school project, Dylan Nowak created an entire identity for an NHL expansion franchise called the Houston Bulls. Below you can see the jerseys that resulted from his work. But if you really want to dig into all that went into this project, including tickets, posters, websites, and anything else you could possibly imagine, check it out here. It's really quite something. The Sabres and Rangers are meeting up at Citi Field on New Year's Day. In preparation, Dylan Nowak has a solid suggestion for the uniforms. Long time no submission! 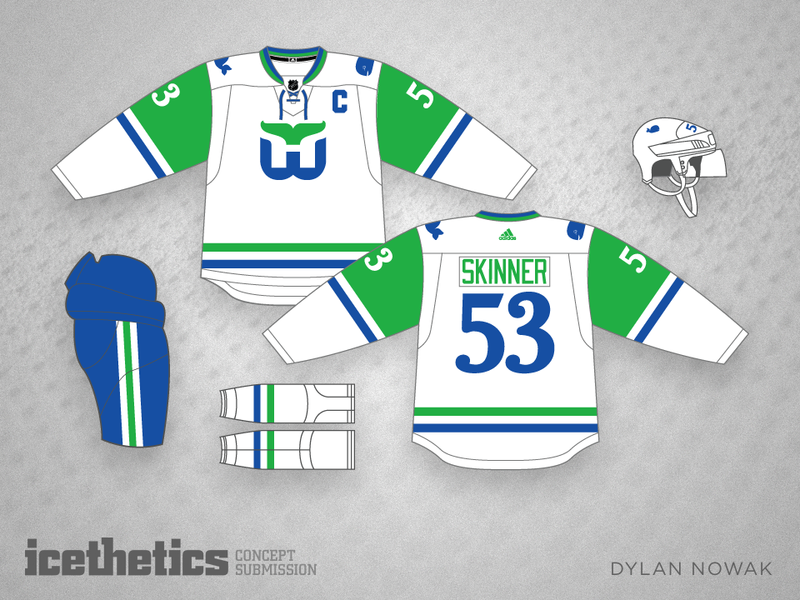 Here is my home and away set for Hartford in the Adidas template. This is my hope if they ever came back. I wanted a brighter color set for Hartford. As my cousin said, "minty fresh." This one's been sitting in the vault for a little while, but we haven't had a good Islanders concept in a while. Dylan Nowak goes with some unique, bold stripes to make this jersey really stand out.